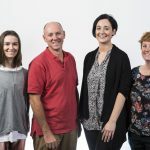 Associate Professor Ashley Mansell is a senior scientist and head of the Pattern Recognition Receptors (PRR) and Inflammation research group within Hudson Institute’s Centre for Innate Immunity and Infectious Diseases. After working as a research assistant for several years in Melbourne, Associate Professor Mansell completed his PhD in 2002 with Professor Luke O’Neill at Trinity College Dublin, Ireland. He returned to Australia in 2002, when he was recruited by Professor Paul Hertzog to lead the Toll-like receptor (TLR) research group at the Hudson Institute, where he has continued to work on the relatively new research field of TLR signal transduction and its role in inflammatory diseases. His research group is primarily interested in understanding how PRRs recognise and signal to initiate the pro-inflammatory response. His group has also made critical discoveries on how this pathway is turned off after activation to limit inflammation and stop chronic inflammation. He has long-standing collaborations with leading researchers in the field, both within Australia and overseas. Associate Professor Mansell has published his research in the highest ranking journals, including Nature, Nature Immunology, PNAS, PLoS Pathogens and the Journal of Biological Chemistry. 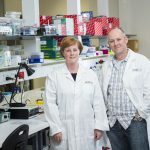 His research has been acknowledged by invitations to present at numerous international and national conferences, and he is the holder of research funding within Australia (NHMRC, Cancer Council) and overseas (Association for International Cancer Research). He formed the Australian TLR research network, TLROZ, and the Infection and Immunity Special Interest Group within the Australasian Society for Immunology Inc. He has also successfully organised national TLROZ conferences. Dowling JK, Becker CE, Bourke NM, Corr SC, Connolly DJ, Quinn SR, Pandolfi PP, Mansell A, O’Neill LA (2014) Promyelocytic leukemia protein interacts with the apoptosis-associated speck-like protein to limit inflammasome activation. J Biol Chem 289:6429-6437. Luu K, Greenhill CJ, Majoros A, Decker T, Jenkins BJ, Mansell A (2014) STAT1 plays a role in TLR signal transduction and inflammatory responses. Immunol Cell Biol 92:761-769. Verstak B, Stack J, Ve T, Mangan M, Hjerrild K, Jeon J, Stahl R, Latz E, Gay N, Kobe B, Bowie AG, Mansell A (2014) The TLR signaling adaptor TRAM interacts with TRAF6 to mediate activation of the inflammatory response by TLR4. J Leukoc Biol 96:427-436. Pearson JS, Giogha C, Ong SY, Kennedy CL, Kelly M, Robinson KS, Lung TW, Mansell A, Riedmaier P, Oates CV, Zaid A, Muhlen S, Crepin VF, Marches O, Ang CS, Williamson NA, O’Reilly LA, Bankovacki A, Nachbur U, Infusini G, Webb AI, Silke J, Strasser A, Frankel G, Hartland EL (2013) A type III effector antagonizes death receptor signalling during bacterial gut infection. Nature 501:247-251. Lang T, Lo C, Skinner N, Locarnini S, Visvanathan K, Mansell A (2011) The hepatitis B e antigen (HBeAg) targets and suppresses activation of the toll-like receptor signaling pathway. J Hepatol 55:762-769. Verstak B, Nagpal K, Bottomley SP, Golenbock DT, Hertzog PJ, Mansell A (2009) MyD88 adapter-like (Mal)/TIRAP interaction with TRAF6 is critical for TLR2- and TLR4-mediated NF-kappaB proinflammatory responses. J Biol Chem284:24192-24203. Mansell A, Smith R, Doyle SL, Gray P, Fenner JE, Crack PJ, Nicholson SE, Hilton DJ, O’Neill LA, Hertzog PJ (2006) Suppressor of cytokine signaling 1 negatively regulates Toll-like receptor signaling by mediating Mal degradation. Nat Immunol 7:148-155.